With one of the fastest treatment times out there and a skin tone sensor that checks AND selects the best intensity level for you, the Smoothskin Gold stands proud. It's the super-safe, no-hassle, foolproof option that gets the job done quickly. It's great for treating your full body and large areas like torso and legs, especially if your skin tone varies across by body part. Find out if it's the perfect one for you by reading this full Smoothskin Gold review. Who should buy it: buy this if you want a fast, no-fuss, foolproof device with advanced safety features. Here’s how I’ve scored it. Plenty of flashes, 10+ years with the SS Gold 200 and 15+ with the SS gold 300. More than you’ll need the SS Gold is at the top of the leader board for lamp lifetime. A sleek unisex design with premium features ensuring it’s safe and foolproof to use. The no-hassle skin tone sensor checks and selects the optimum intensity for your skin before every flash so it’s perfect for medium dark skin tones. 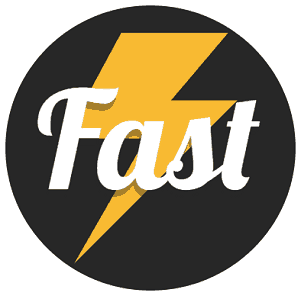 One of the fastest treatment times available at higher intensity levels – from just 8:30 mins to treat a full leg. Friendly and professional support from Smoothskin, excellent web resources which could only be improved with a treatment calendar App. 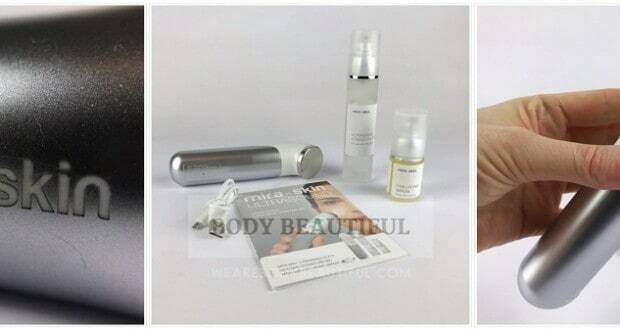 Very positive reviews showing love for the foolproof skin tone sensor and fast treatments. Superb value with a choice of models and prices. I recommend the SS Gold 200 at a great mid-range price. Offers are common so check prices before you buy. The Smoothskin Gold home IPL hair removal machine uses Intense Pulsed Light to slow and reduce hair regrowth on your body and face. With regular top-up treatments you’ll stay smooth and fuzz-free. First available in late 2014, the Smoothskin Gold is the big and more powerful sister of the new Smoothskin Bare. There’s a choice of models with either 120,000, 200,000 or 300,000 lamp flashes at different prices. You can buy it in the UK, Europe (it adheres to EU CE regulations) and Australia. It has FDA clearance so is also available in the USA. SmoothSkin recommend up to 12 treatments at weekly intervals (11 weeks to complete). After 6 weeks you should start to see some reduction and after 11 weeks the results should be significant. Then follow with regular top-ups to maintain your smooth skin results. I saw the effects after just 2 treatments. The SS Gold is manufactured by Cyden who have a solid history in home-use IPL dating back to the first Smoothskin available in 2009. Their knowledge has delivered a sleek and stand-out design, with premium features at an affordable mid-range price. The SS Gold was the first of it’s kind with an advanced skin tone sensor that chooses the optimum intensity level for your skin tone. It also has strong online feedback and one of the fastest treatment times available at high intensity levels. It’s a fine choice for face and full body treatments. Learn more in the full review to decide if it’s right for you. What’s the feedback from the online Smoothskin Gold reviews? Smoothskin Gold 120, 200 or 300? Should I buy the SS Gold? Is the SS Gold good value? Yes. There are 3 models to choose from, each has the same treatment window size of 3 cm² and a different bulb life and price tag. All 3 models provide plenty of treatments to get to your smooth and maintain it for many years. They’re all good choices for full body treatments or treating large areas like legs, back and torso. The SS Gold 300 with 300,000 flashes gives an impressive 900,000 cm² total treatment area. That’s over 200 full body treatments for over 15 years of monthly top-up treatments. The SS Gold 200 with 200,000 flashes gives a treatment area of 600,000 cm² which is ample for around 150 full body treatments and 10 years of monthly top-up treatments. The SS gold 120 with 120,000 flashes give a treatment area of 360,000 cm² for around 100 full body treatments and over 5 years of monthly top-ups. Smoothskin also say the 120 will provide monthly treatments for up to 6 years, the 200 for up to 10 years and the 300 for up to 15 years based on the recommended treatment regimen. This chart shows how long the Smoothskin Gold models bulb-life lasts compared to other home use devices. The SS Gold 300 lasts the longest, but do you need all those flashes and is it worth the higher price tag? Keep reading to find out! Keep reading to find out which model I think offers the best value. N.B. Bear in mind the estimated years of use above is based on the bulb life only and doesn’t take into consideration general usage, wear and tear that effect how long the machine keeps working. Read on to learn why the Smoothskin Gold is so special to use. It’s like opening a very expensive and well-presented gift. The black device is secured on a velvet-clad casing sitting inside a small, fancy yet robust box with a magnetic clasp. Hang on to that to store it and keep it safe. The hand-held device is a distinctive shape and attractive design. It’s sleek-looking and a good-size. The top-and-tail are glossy black, with a silicone-type grip on the sides and subtle gold trimmings. It’s modern and sophisticated and just begs to be picked up. In your hand it’s balanced and comfortable. The ergonomic design lets you grip it in various ways to work at different angles. It feels good, not flimsy or cheap. The 190 cm power cord looks plenty long enough and it fits securely in the base of the device. The user manual is the place to start. Start off by reading the user manual. Double check the list of important reasons not to use the Smoothskin under ‘Warnings’ and the photosensitivity causing medications available in this pdf from their website. 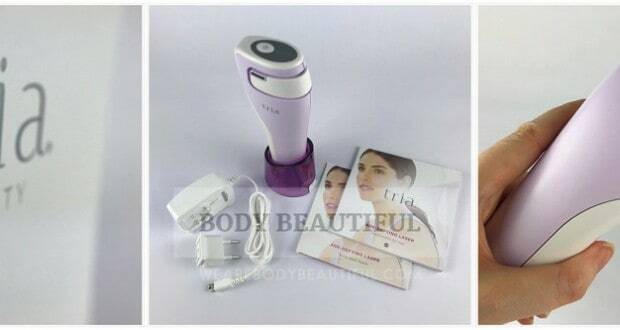 The manual introduces you to the device and how IPL works, how to operate it, your patch test, skin tones and the skin tone sensor, caring for the device and troubleshooting any problems. It’s very clear, comprehensive and easy to follow. And the best part is that you don’t need to spend time working out which intensity levels you can use. The skin tone sensor selects the safest and most effective intensity level for you, before each and every flash. It’s the only device that does that. There’s more on that later. Follow the instructions in the manual for your skin patch test. Test each body area you’ll use it on. If after 24 hours your skin shows no reactions you can continue with your treatment. Smoothskin says don’t use it on recently tanned skin, including artificial tans. After your treatments, you should also cover up and use a sunscreen of SPF 15+ to avoid unprotected sun exposure. The manual doesn’t give any specifics on how long to wait, but the website FAQs are more helpful. They advise you avoid the sun for at least 7 days before and after your treatments. It’s very simple and easy to get started with the Smoothskin Gold. Plug it in and press the power button so the light changes from blue to white. Press the handset firmly against your skin and the power intensity indicator lights will illuminate white to show your level, from 1 to 10. If not in use for 3 minutes the device will revert back to standby mode and the power button will show blue. The flashes are bright, and the user manual tells you to look away for each flash. Make sure you use it in a well-lit room and you can try wearing shades if it’s too much. Both skin tone sensors also need to be correctly positioned before it’ll flash, so this avoids any accidental flashes. 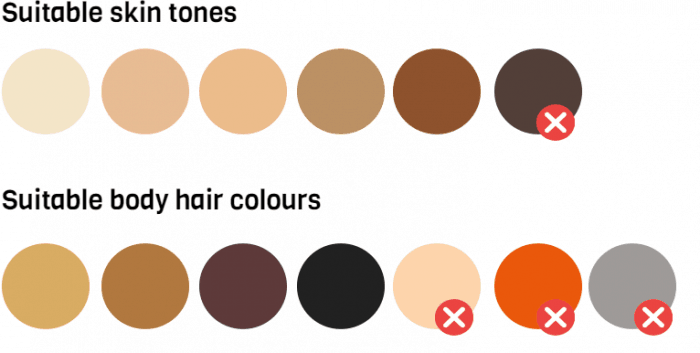 Most other skin tone sensors just check that your skin tone is within a suitable range. They don’t tell you the best intensity level to choose for your skin, let alone actually select it for you. This is where the SS Gold is very special. 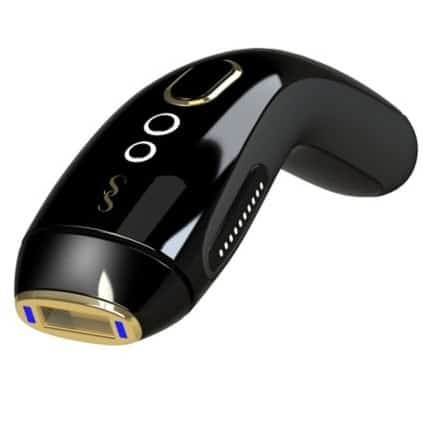 The smoothskin Gold features Detect & Set where 2 skin tone sensors check your skin before each flash and choose the safest most effective intensity level for your skin. Two skin tone sensors on either side of the flash window check your skin before each flash and choose the safest most effective energy intensity level for your skin. Not too high and not too low, this means each flash is the perfect balance of power and safety for your skin. Each flash is the most effective and comfortable it can be. It’s foolproof. The chosen level, from 1 to 10, is shown by lighting up the intensity level indicator lights on the side. If your skin is too dark, a red light will show on either side and it won’t flash. The ‘feather’ button on the Smoothskin Gold turns on gentle mode, great for using on more sensitive areas like the bikini line. And because some areas are more sensitive than others and might be a bit uncomfortable on a higher intensity level, there’s a ‘gentle mode’. Press the ‘feather’ button on top once and it reduces the intensity. Press it again to go back to the standard power mode. I have smallish hands so it took a bit of practise to work out the best grip. I tried gripping the handle in my hand with my thumb resting on top of the flash button. Then I tried holding it on the sides between my thumb and middle finger, so my index finger rested on the flash button. It’s easy to position and even though I didn’t find either grip totally natural, by alternating it I didn’t strain my thumb, finger and wrist. If you have smallish hands you may find it the same. But after a few goes I didn’t notice it anymore. The best thing about it is the fast treatments, so there’s little opportunity to feel any strain. Read on. You get the usual single flash (‘Stamp’) and continuous flash (‘Glide’) modes. For Stamp you press and release then re-position and repeat. For Glide keep the button pressed and after each flash slide, or ‘hover’ the handset over your skin to the next position. The flashes come every second or so. This means that, although the motion is not continuous using the highest intensity levels, it is easy and really quick. It’s great for treating large areas like your legs, where with slower devices it’s more of a ‘slide…and wait’. Try altering your grip periodically if you find your thumb or finger strains, but covering large areas is quick so it’s not a big deal. Read on the learn how quick it is. SS Gold has fast treatment times and because it’s mains-powered it’s great for blitzing through full body treatments in one sitting. All the models have a big 3 cm² treatment window and they flash every 1 to 2 seconds, depending on the energy level used. To treat a pair of underarms (an area roughly 120 cm²) it’ll take from 40 seconds up to 1:16 minutes. That’s 30 seconds faster than the Philips Lumea devices. Smoothskin say you can treat a full leg in just 8:30 minutes, vs 14 minutes with the Lumea. That’s a big difference and, if you have the concentration power, it could be a good option if you want to do your full body in one sitting. Just one device matches it on treatment times. SmoothSkin also say you can treat a full body in under 20 mins (full legs, bikini, underarm and upper lip). This is a tad optmistic, it doesn’t take into account the time you need to re-position yourself and work around knees, shins, ankles and other trickier surfaces. One reviewer reported it was closer to 40 minutes, and another took 20 minutes to do two full legs and armpits. But there’s no doubt it’s a fast choice for treating large areas like legs, torso and back. Reaching the backs of knees and upper legs is tricky, and requires some funny positions to manage! This is where I noticed the power-cord but it didn’t cause any great problems. I recommend using a power extension cable so you get the full length of the power cord to work with. Treating the upper lip is also tricky. Pulling faces and stuffing my tongue behind my upper lip are necessary to make it flash. Smoothskin suggest using a piece of white card to protect your lips. But it’s just awkward and would be easier if a smaller attachment was provided (it would help with bikini areas too). Smoothskin give a standard 2 year warranty and excellent customer support. To get in touch you can call or use an online form. We received prompt and thorough responses within 24 hours. There’s also dedicated post-sales support service should you need any help with the device. This is top-notch customer support where you feel you’re in knowledgeable, safe and friendly hands. What do online Smoothskin Gold reviews say? 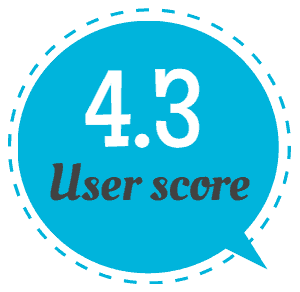 From all the collated online Smoothskin Gold reviews, it scores a very strong 4.3 stars. Low ratings came from users with unsuitable skin or hair colouring, and a few report faults, although the problems were resolved under warranty. A handful of users didn’t get the results they expected. Some were just a few weeks in to the treatment regimen, others just about finished but had seen little to no difference in their hair growth. One disappointed reviewer, after using it for several months, hadn’t yet made it to completely hair-free. Yes. Clinical trials have shown that SmoothSkin Gold produces permanent results. In one trial, 94% of women experienced visible, permanent hair reduction. To get the best results, you must ensure you use the device for an initial period of 12 weeks, then just once a month afterwards for continuously hair free skin. It’s important to have realistic expectations and understand the results get progressively better over time. Most users are still perfectly happy when they know they’ll need to use it periodically to maintain their results, because it sure beats painful waxing, ingrown hairs and shaving rash. There’s more on the permanency of IPL here. It’s not surprising that loads of reviewers LOVE the foolproof skin tone sensor and the fast treatment times. They also love the look, design, and ergonomic shape. Just a few felt slight strain after using it for around an hour. And there are some great results too. SmoothSkin recommend 12 treatments at weekly intervals (11 weeks to complete). After 6 weeks you should start to see some reduction and after 11 weeks the results should be significant. Then follow with top-ups monthly, or as you need them, to maintain smooth skin results. Here’s what reviewers reported. Many saw results from the first and second treatments and for others it took 4 or 5 sessions. Hair growth was thinner, finer and sparser, soft and unnoticeable. Some had bald patches, and were shaving less frequently, if at all. The speed of results varied by body area too. Results after all 12 treatments are best with upwards of 80% hair reduction reported. Lots of the happy reviewers say the results are ‘lifechanging’. Which Smoothskin Gold is best? All of the models promise the same foolproof simplicity and fast treatment times. It’s just the bulb-life and cost that’s different between the 3 models. Don’t feel you need all the extra flashes from the Gold 300. It provides more flashes than you’ll ever likely use, and personally I don’t think it’s worth the extra cash. The Gold 200 provides ample treatments, and if you can stretch your budget (or if you find it on offer), it’s a reassuring investment that will keep giving for up to 10 years. If budget or availability is the deciding factor, don’t worry. The Gold 120 is still a fine choice for treating your full body or large areas like legs, back and torso. 6 years of smooth skin results sounds great too. Keep your eye out for periodic money off promotions in the UK. Pick up a bargain when the price of the 200 and 300 drops! 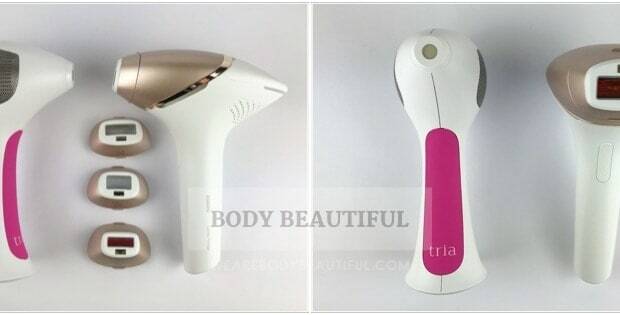 The Braun Silk-expert and Philips Lumea BRI956 are worthy alternatives. The Braun Silk-expert / Gillete Venus Silk-expert is almost identical to the Smoothskin gold, which isn’t that surprising because Cyden Ltd manufactures both. The Braun Silk-expert is newly available in 2016 and it’s got all the same good bits. The same intelligent skin tone sensor (with a new name), same gentle mode and same fast treatments. It’s white, has a subtly different shape and other minor stuff i.e. there’s no on / off power button. 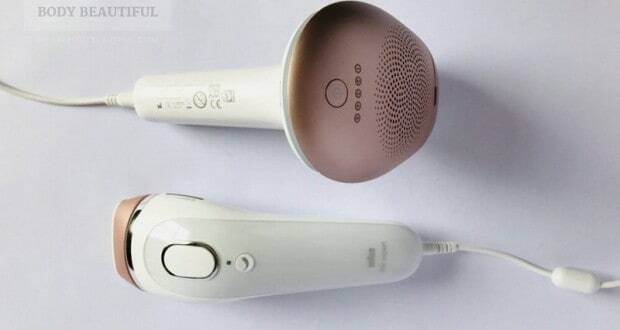 Braun also pack in a bonus appliance (facial cleanser brush or a body exfoliator) with some models. Check how many flashes it comes with (either 120,000 or 300,000) and weigh it up against the Smoothskin Gold models available. Braun’s customer support is good but the support programme and 90 day money back guarantee from Smoothskin is better. Online reviews rate both highly. It’s tough to choose so check the prices of each to help you decide. The Lumea Prestige BRI956 is definitely worth your consideration if you live in the UK or Europe. 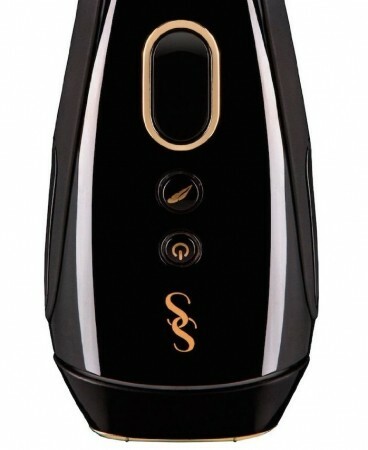 It wins my Best Overall home IPL hair removal award with several unique benefits. Use it both corded and cordless and appreciate the gun-shaped design for unrivalled comfort and ease. The Smartskin tone sensor recommends your optimum intensity level, but you can manually turn it down a notch if you like. It also has curved treatment windows to match the contours of your body, and the treatment times are the fastest out there at higher intensities. A full leg is done in around 6.5 minutes! You get a 100-day money back guarantee too – that’s great reassurance. The only downside? It’s expensive at full RRP but deals are common. Also, it’s not available in the USA or Australia yet. In that case the Smoothskin Gold or Braun IPL are the best choice. And finally, check the Smoothskin Bare. It’s new from Smoothskin and it’s different; it’s no-frills but has unlimited flashes, is less expensive, has even faster treatments and you get the same excellent support from Smoothskin. Online reviewers say it’s “a massive game-changer when it comes to hair removal” – read the full review and a Smoothskin Gold vs Smoothskin Bare comparison here. 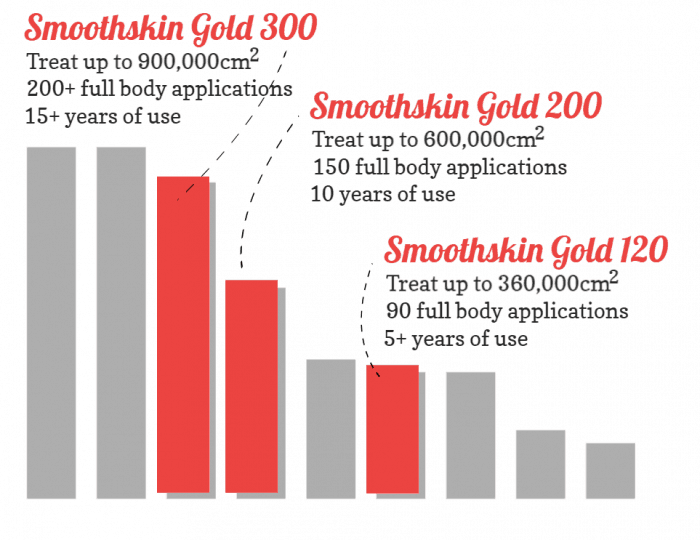 Here’s a quick recap of the pros and cons of the Smoothskin Gold to help you decide. No-hassle skin tone sensor checks your skin AND selects the best intensity level for you before each flash. Each flash is the perfect balance, not too high and not too low. Should I buy the Smooth skin Gold? Yes. This is the one if you want fast, no-fuss treatments. 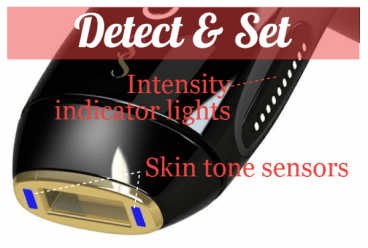 And if you want plug-and-play simplicity or the reassurance of extra safety precautions, then the Detect & Set skin tone sensor is a big draw too. It’s particularly helpful for medium-dark skin tones. These are great features if you are treating your full body or large body areas like the legs, torso and back. I recommend the Smoothskin Gold 200 as it’ll provide ample treatments. It’s worth keeping an eye out for periodic money off promotions too. You can check prices or buy the Smoothskin Gold using the links below. 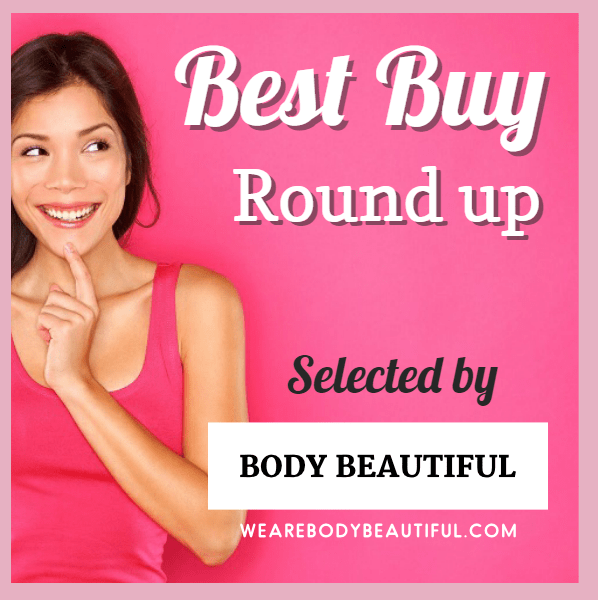 Buy from CurrentBody.com: UK & International orders, 90 day money back guarantee and other great deals. Buy from Shavershop.com.au: Australia orders, with 90 day money back guarantee.